Does Your Cat Have Bad Breath and Drooling Issues? Can the Cause Be Bad Teeth? For a cat still active for his age but showing signs of drooling and sporting an unkempt hair coat, a thorough oral exam is necessary. While diseased gums and or teeth are always a possibility, other conditions must be ruled out as well. Most people think only dogs drool, but cats can too. The most benign reason would be that some cats drool when they are happy, relaxed and purring. There shouldn't be any unpleasant odor and they should still be grooming as they normally would. A cat that has suddenly started drooling could be a sign of a toxin or irritant ingestion, or perhaps an injury, such as biting into an electrical cord. For a cat that has gradually stopped good grooming habits or has a poor hair coat, one possible explanation is if the cat is overweight -- they simply can't reach everywhere like they used to. A typical pattern is a triangle of matted or poorly groomed hair on the back, by the base of the tail. Poor nutrition and some hormonal or metabolic diseases can also cause poor condition of the skin and haircoat. 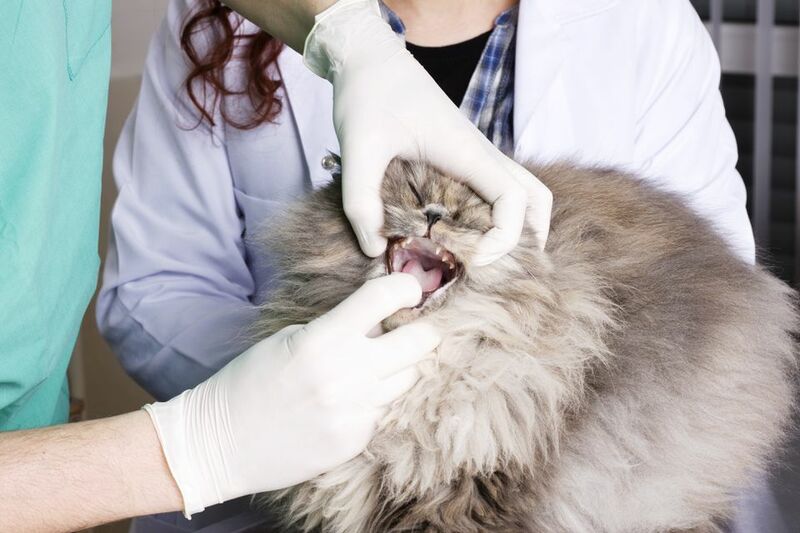 For a cat that has shown gradual changes in grooming habits paired with a malodorous drool, your veterinarian will want to do a complete oral examination to look for potential causes. Possibilities include, but are not limited to diseased teeth and gums, an oral foreign body, or an oral tumor (more common in senior cats). A senior cat with a foul odor, drool, and poor grooming habits, after ruling out obvious dental/gum disease, would be suspect for an oral tumor. While dogs often have benign growths in the mouth, cats more commonly have malignancies. Many cats remain hungry and interested in food, at least initially. The owner feeds the cat, sees the interest in food, but may not notice that the cat is only eating a small portion or not at all. Common oral tumors for both dogs and cats are squamous cell carcinoma, fibrosarcomas, and malignant melanomas1. Oral tumors can be anywhere, but the ones under the base of the tongue can be hard to see at first. The tumor grows, ulcerates, and becomes infected. This is cause for the odor and in some cases, pain. These tumors themselves are generally not painful, but the infection is. While the tumor might not be readily apparent, it can interfere with normal swallowing, and this leads to drooling and inability to eat. As with human medicine, treatments are available in the form of surgical excision, chemotherapy, and radiation. The patient's age, overall health, size and invasiveness of the tumor all come into play when deciding the best treatment option. Any time your pet exhibits a new behavior, clinical sign, or general change in attitude, please consult your veterinarian as soon as possible -- hopefully, it is something that is easy to address. In the case of something more serious, the sooner the problem can be attended to, the better.